01 Dec This might just save your life! So perhaps the title of this blog is a little over the top, but I had a customer recently who needed help when their .mpp file became corrupt due to a VPN issue (I think the file was left open on the file server when the VPN link was terminated)! We couldn’t easily fix the corrupted file, and so the customer rebuilt it, but it did start me thinking about what the end user could to protect themselves a little more. This is obvious isn’t it, but how many people do it, and shouldn’t IT back everything up for me anyway? Well, people don’t do it because it’s tedious to always click Save As, and think of a new version name etc. 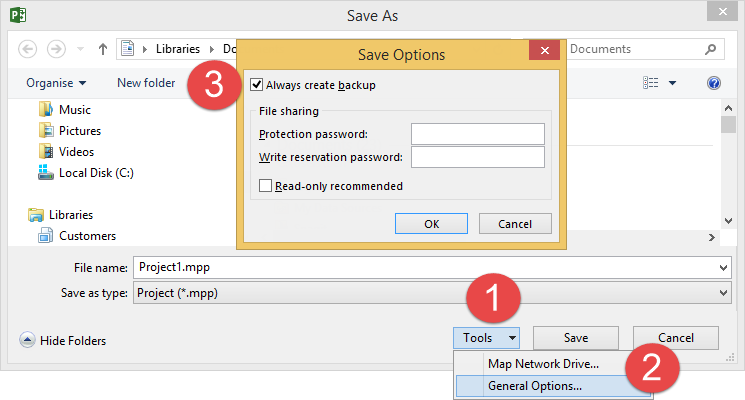 However, you can have Project (and probably the rest of Office for all I know) automatically do this for you – just click the Always create backup checkbox in the Save Options dialogue box, which is available when you click Save As – see the image below and just follow the steps 1,2,3! Ok, how does this work? The 1st time that you save the file, it saves the plan and also creates a backup of the plan, appending .BAK to the file name. You can see from the image below that the .mpp and the .BAK file are both the same size and have the same timestamp. On the subsequent saves, the .mpp plan is renamed .BAK, and a new file is created, as .mpp. You can see from the image below that the .mpp and .BAK files have different sizes and timestamps. And one more save further highlights the changes. So, it for some reason the .mpp plan becomes corrupt, I can easily delete it, and rename the .BAK file to .mpp. Had my customer had this in place he would have saved himself both time and money. 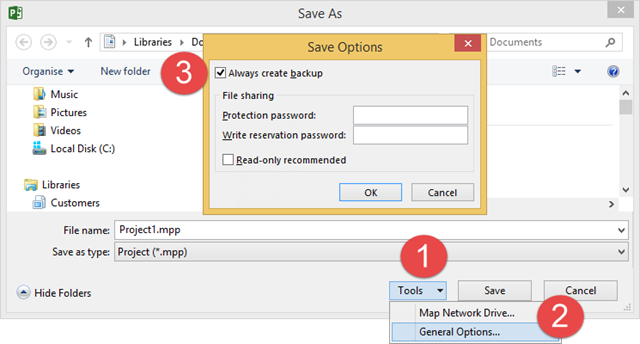 If you used this in conjunction with the snapshot technology that is supported in Windows Server, then you’re likely to have at least one backup. If you are working without a file server, then of course make sure you backup your data regularly to a USB disk (2TB portable USB3.0 disks are available for under £100), or use OneDrive (15GB free storage, or go for unlimited storage with an O365 subscription). I cannot stress the importance of backing up your data, especially if working with Solid State Drives, as when they fail, it’s very difficult to recover any data at all. Are you looking for help with your project and project online implementation?